The Year 2009 has been marked by a high performance and visibility of the East African Community. The year begun on the inspirational note of the High Level Retreat for EAC Organs and Institutions held in Kigali in February 2009, under the theme, “Making EAC a more Effective Institution”. The strategy retreat resolved to mount robust collaborative effort towards rapid achievement of integration objectives and demonstration of tangible benefits of regional integration. With this resolve, we took our strategic development plans to higher stages of implementation. Priority was placed on projects in infrastructure - roads, railways, inland waterways, ports and harbours, communications/ICT, energy and civil aviation. Construction works commenced on the Arusha-Namanga- Athi River road in April, a vital section of the East African Road Network providing linkages through Tanzania and Kenya to Uganda and on to Rwanda and Burundi. The ambitious East African Railways Master Plan intended to rehabilitate and revamp the railways system was also launched. Continuing the emphasis on infrastructure development, the Power Interconnection Project between Kenya and Tanzania at the Namanga border post was commissioned. Similarly, we intensified activities in other sector projects and programmes, including the East African agricultural and rural development programme, Lake Victoria Basin Development and programmes in the productive and social sectors - health, gender and community development, tourism and wildlife, education, culture and sports, science and technology. Our work in the promotion of a vibrant single market and investment area in East Africa culminated in the attainment of the threshold of a key element of a full fledged EAC Customs Union, namely the phasing down to zero tariffs for all goods traded within the region with effect from 1st January 2010. In collaboration with the East African Business Council (EABC) the EAC undertook trade and investments promotion activities to key world trade centres in Europe, Asia and North America. The Second EAC Investment Conference was held in Nairobi in July which was attended by a record number of over 1,800 regional and international investors. The conference realized great success in promoting the region’s economic potentials and investment opportunities. The enactment, earlier in the year, of the EAC Trade Negotiation Act was a major breakthrough in the longstanding search by the EAC Partner States to negotiate as a bloc in the multilateral trade fora. The EAC pursued negotiations of the Economic Partnership Agreement (EPA) with the European Union. We also participated at the forefront of the Tripartite EAC-COMESA-SADC initiative towards the establishment of a Free Trade Area of the three major African regional economic communities. This larger trade area will further boost EAC’s market advantage and strength. 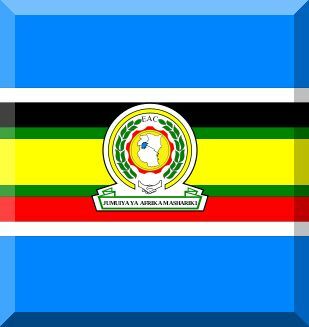 The signing of the EAC Common Market Protocol, now targeted to come into force on 1st July 2010, coincided with new momentum gathered in the process towards the establishment of the East African Monetary Union. In addition to the activities in economic integration and trade development, EAC worked towards promoting greater political will and development of policies for good governance, anti-corruption, democracy, rule of law and protection of human rights in the region. Equally, we promoted foreign policy co-ordination , conflict management, prevention and resolution; and defence co-operation. EAC’s abiding concern remains to align national political activities and trends with regional integration objectives as the region moves towards deeper integration and rapid socio-economic transformation. The EAC celebrated its 10th Anniversary this year marked by the enthusiastic participation of East Africans of all walks of life throughout the Partner States. The celebrations had a great impact on raising positive awareness of the EAC as well as demonstration of the benefits and achievements of regional integration and , on the whole, invigoration of the spirit of East African unity and development. A clear signal was sent out that the EAC has reached a turning point. There is definite and clear will for deeper and sustainable regional integration. The task ahead for us is to maintain this momentum, build on the success realized so far and engage more robustly on regional integration for a brighter future for East Africa under the EAC 10th Anniversary’s clarion call of East Africa: One people, One Destiny. Our challenges during 2010 are clear cut: to achieve the broad objectives of a full fledged EAC Customs Union; ensure timely ratification of the Common Market Protocol and launch its operations; speed up the process towards the realization of EAC Monetary Union ; and launch preparation of the 4th EAC Strategic Plan (2011-2016) with focus on intensification of activities and programmes in economic, political co-operation as well as co-operation in the social sectors towards a fully integrated East Africa. As we come to the close of the year 2009, I would like to take this opportunity to thank our Heads of State, the Council of Ministers, fellow heads of EAC Organs and Institutions, the Staff of the East African Community, all the key players and actors in the EAC integration process, notably the East African Business Council and all the citizens of our region and our development partners for the commitment, dedication and support expressed and extended in many ways which have led to the major advancements the EAC made during the year. I extend to you all, your families, relatives and friends best wishes for the Festive Season and a Prosperous New Year. Secretary General, East African Community.